The brainchild of Grameen Foundation founder Muhammad Yunus, microfinance is a form of banking whereby financial institutions offer small loans to the poor. The idea behind the concept, which originated in Bangladesh in the mid 1970s, is that motivated and disciplined poor people could climb out of poverty if they had access to funding-even small amounts-that help get businesses off the ground. With access to revolving loan funds, these “micro-entrepreneurs” can build businesses, pay back the borrowed money, and continue to provide for themselves and their families in a sustainable manner. A classic example would be a woman who borrows $50 to buy chickens so she can sell eggs to other members of her community. As her chickens multiply, she can sell more eggs, and eventually she can sell chicks as well. She pays back the money and has climbed out of a perhaps desperate situation financially-and the community benefits from having a new source of nutritious food. “Having access to money to start a small business isn’t about fulfilling a dream, it’s literally about keeping their families one step ahead of starvation and putting a roof over their heads,” says Tracey Turner, founder of MicroPlace, an online “microfinance marketplace” launched by eBay in 2007. Individuals can put small or large amounts of money on MicroPlace and get a rate of return in the two- to three-percent range-better than a donation-and get the satisfaction of knowing that their cash is helping someone in a developing country improve their lot and that of their impoverished community. On the environmental front, microfinance is, in and of itself, “green” in that it promotes businesses that can be sustained indefinitely. Example after example over the last three decades have proven the concept that when poor people are given opportunities to earn a living in a legitimate and sustainable fashion, they have little or no need to pillage their surrounding natural resources to shelter or feed themselves. Also, most of the financial institutions involved in microfinance hold up sustainability as a precondition for awarding loans. Others encourage greener businesses by offering lower interest rates to borrowers with sustainability-oriented plans. While upstarts like MicroPlace and Kiva (which operates on a similar model whereby individual investors can get in on the microlending fun) are grabbing most of the microfinance headlines these days, Grameen Bank was the first microfinance lender in the world, initiating its first project in 1976 in the Bangladeshi village of Jobra. Today Grameen does a lot more than just offer small loans. It also accepts deposits and provides other banking services, and runs several development-oriented businesses including fabric, telephone and energy companies. And it has spawned thousands of other institutions doing similar things: World Bank statistics show that more than 7,000 microfinance institutions serve some 16 million people in developing countries with $7 billion in outstanding loans, 97 percent of which are repaid. 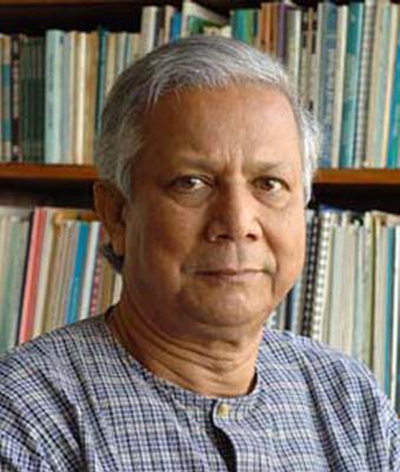 In 2006, Grameen founder Muhammad Yunus was awarded the Nobel Peace Prize for his efforts. CONTACTS: Grameen Bank, www.grameen-info.org, MicroPlace, www.microplace.com; Kiva, www.kiva.org.